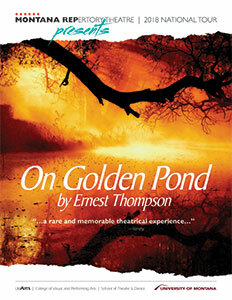 Under the direction of Greg Johnson, Montana Repertory Theatre has selected ON GOLDEN POND for its 2018 tour. The Rep will bring this American treasure to audiences throughout the United States. Now one of the most dynamic and respected touring companies in the country, Montana Rep assembles principle actors, directors and designers with prestigious credits, including Broadway, Off-Broadway, national tours of Broadway shows, and major regional theatre credits. For the tour itinerary, click here. To learn more about Montana Rep and this production, click here.